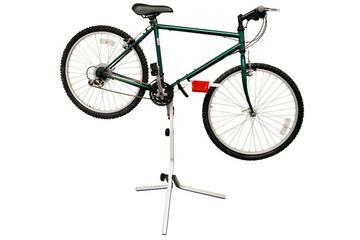 The Gear Up Simple Man Workstand combines function and utility into a price that won't break the bank. Features include 3 different height adjustment settings, removable parts and tool bin, and a quick-lock strap for securing your bike to the workstand. Combine these features with the quick assembly time and you've got an economical workstand perfect for use at home or at the races.Use the Gear Up Simple Man Workstand to make it easier to perform general maintenance on your bicycle. The stand allows the pedals to still turn with the bike loaded which makes activities like lubing the chain a breeze. Great for cleaning and lubing your bicycle as well!Installed dimensions 42" high, 29" wide, and 23" deep.Weighs 8 lbs.